Camping with a motorcycle is perhaps the ultimate expression of freedom. On two wheels you can get off the road and look for places where camping is inaccessible to other vehicles. The contact with nature is full on. Nothing to do with camper vans! If a tent is bound to become your home for quite a long time, you have to pick one methodically. Sizes and types are personal choices, as long as they go hand in hand with lightness, strength and water resistance. Quality tents cost but do not skimp on this expense. If climate and temperature change over the course of the ride you have drawn, the tent has to protect you from wind and rain. If you aim to go north you need at least a 3 seasons tent and a suitable sleeping bag. 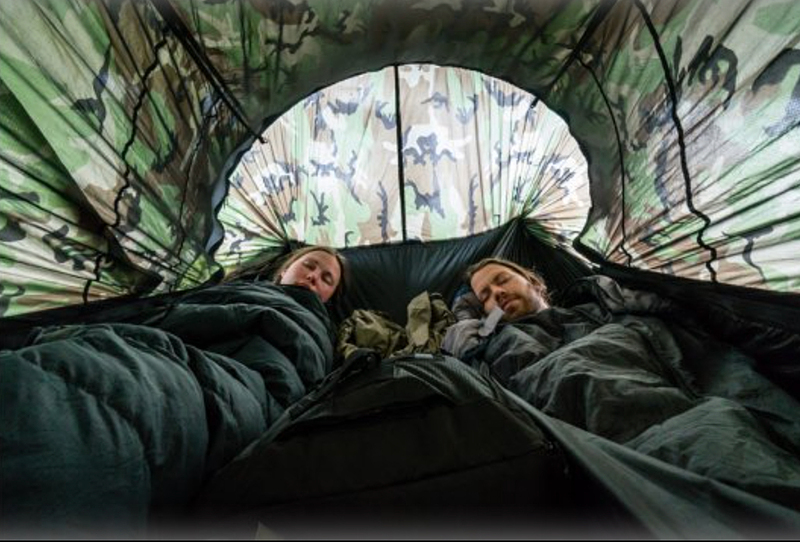 If you are travelling in two you can share a tent but not the sleeping bag. To your camping equipment you will need to add a rechargeable lamp, a stove and some crockery. In general, the ideal bike-travel in a tent is that which develops in temperate climates. Well, the fact that every day, or almost, the tent should be mounted in the evening and diasassembled in the morning. It is true that with time, you will learn to choose the most suitable place to set up your camp in the quickest way. €599 on the European distributor website. 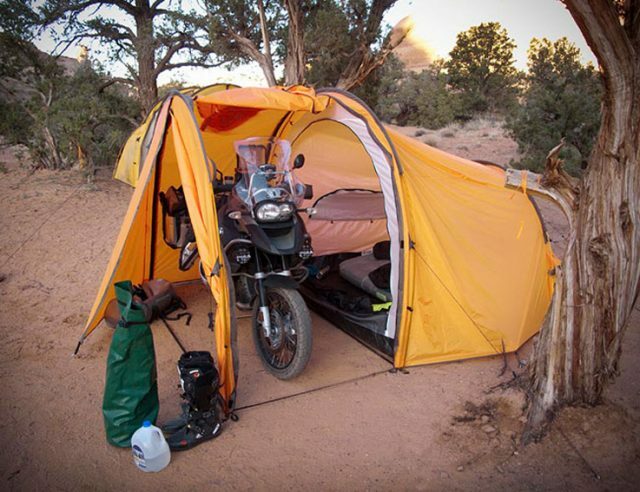 The Expedition tents for motorcyclists offered by the giant from Denver (Colorado) REDVERZ are the “Ultimate” solution. According to the manufacturer, the tunnel models that we present are eligible to “win the first places of the list”… The Atacama, well-known to globetrotter riders, has recently been redesigned and now presents itself as the most spacious, functional and high quality on the market (the most expensive too we might add). Despite being 15 cm shorter than the previous one, it offers a larger sleeping area, which can accommodate up to three people and sized to be able to sleep also along its length. In addition, the J-Door entrances are now two, feature that allows you to crawl into your sleeping bag without climbing over your mate. The fabric is more resistant to tearing and the pickets, now 23 cm, are more versatile and robust. The new Atacama Expedition also has an indiscretion net on the vestibule of the garage door. Additional ventilation dramatically reduces condensation and the new storage pockets allow you to fully insert the Hi Visibility ropes. There are two sturdy nylon floors, for the bedroom and garage. The large garage environment, built to shelter motorcycles (it can accommodate an adventure tourer with hard suitcases) has greatly evolved from the original version. The space has sufficient height to stand up and allows you to work around the bike, change clothes, etc. In general, the flexible design in circles also works well in strong wind conditions. The structure with three poles allows easy assembly / disassembly. The tent can be carried in a 50-litre bag. 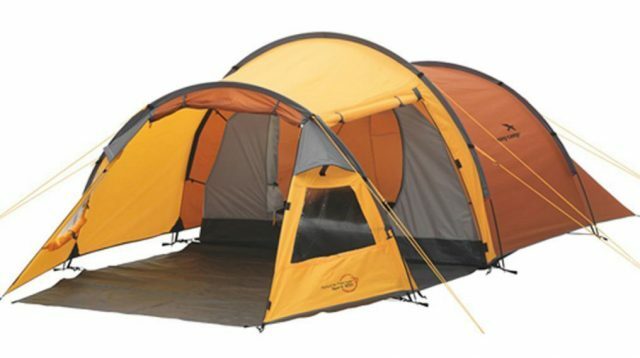 SPECIFICATIONS: 3-season tent; People: 3; average weight: 6 kg; maximum width: 254 cm; Maximum length: 510 cm . 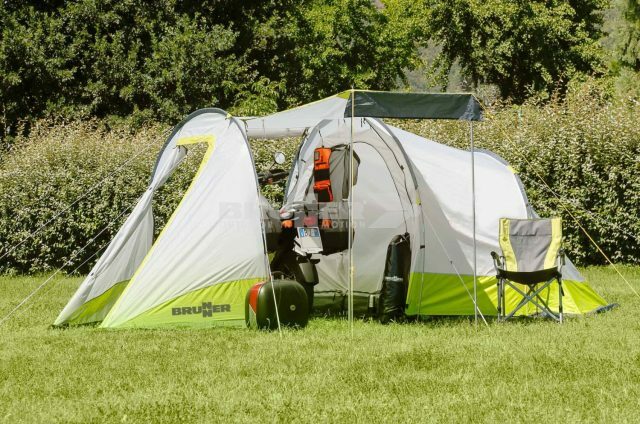 ; Floor size: 229 x 127 cm; Bed area: 234 x 241 cm; Motorcycle area: 254 x 127 cm; Vestibule area 5.6 square meters; Maximum height: 195 cm; Doors: 4; floor fabric: 70D 190T Nylon Rip Stop 10,000mm; Waterproof Fabric: coated with ripstop Nylon 68D 210T 4,000 mm; interior fabric of the tent: 75D 190T / P breathable; mosquito nets: indiscretion nets B3; n. poles: 3 7001 T6 aluminium; Packing size: 53×23 cm. 499 US dollars on REDVERZ Usa (no delivery to Europe). 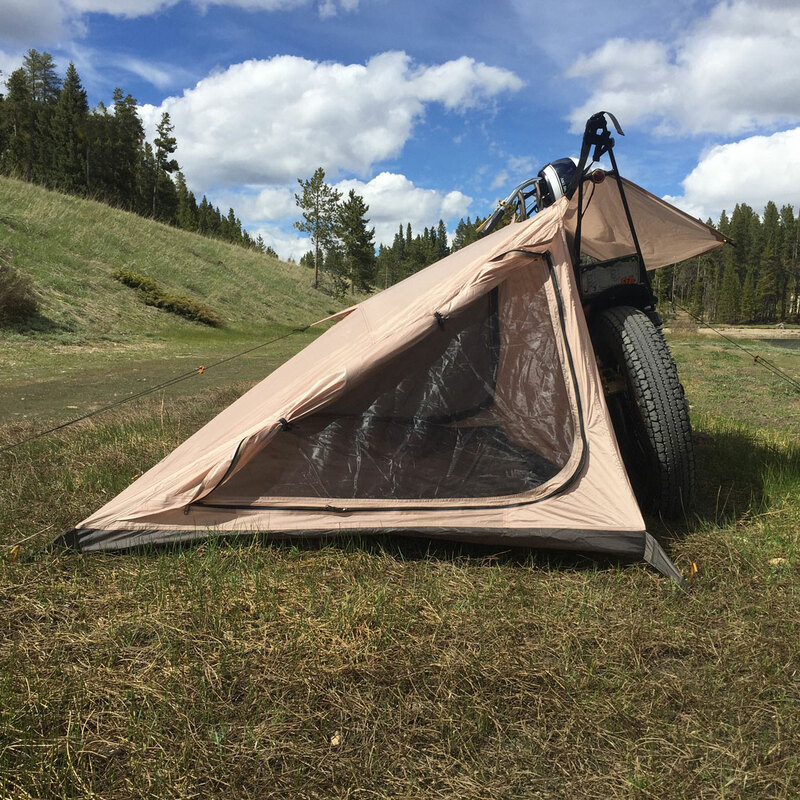 This second solution by the American Redverz Gear is advertised as the tent designed “for you and your motorcycle.” We add that if you squeeze a bit a second person may sleep in it. The tent is an intermediate solution between the Atacama and the iconic Ténéré, of which it recalls size and weight of the packaging while offering greater overall comfort. For instance it has almost 5 cm more in height, and almost double the entrance surface (vestibule), always with two J-Door entrances. The other characteristics relate to the materials which are the same as the Atacama. 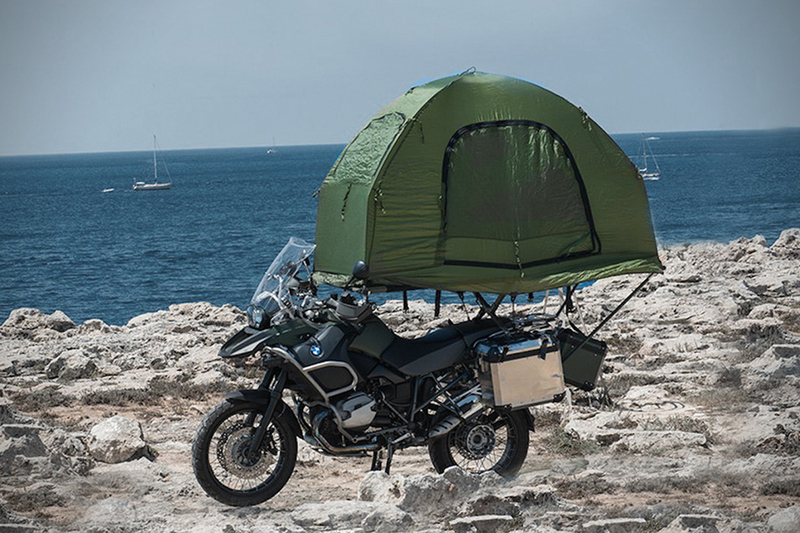 Its evolution, compared with the Ténéré, has also concerned the garage space, which recalls the size of the top-of-the-range tent and therefore can accommodate tourer type Harley-Davidson Ultra Classic or maxi enduros. The 2 pole structure makes assembly and disassembly easier. 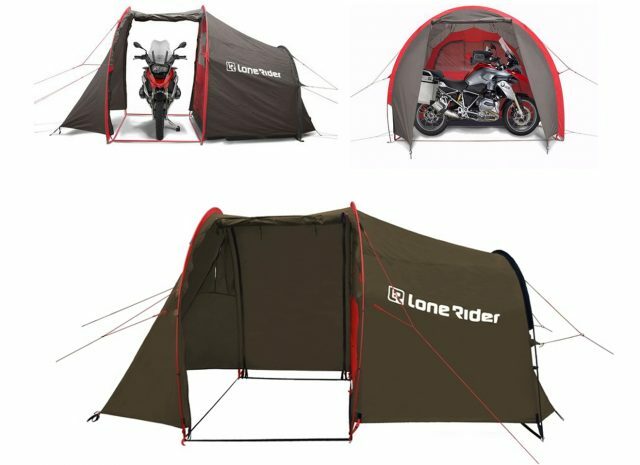 SPECIFICATIONS: 3 seasons tent; 1-2 people; average weight: 5.4 kg; maximum width: 254 cm; Maximum length: 370 cm; Floor size: 229 x 127 cm; sleeping area: 230 x 105 cm; Motorcycle area: 254 x 127 cm; vestibule area: 2.4 square meters; Maximum height: 195 cm; Doors: 4; floor fabric: 70D 190T Nylon tear-proof 10,000mm; Fabric Anti-rain: coated with nylon tear-proof 68D 210T 4,000 mm; interior fabric of the tent: 75D 190T / P breathable; mosquito nets: indiscretion net B3; n. poles: 2 7001 T6 aluminium; Packing size: 53×18 cm. It can accommodate one or two people, luggage and a motorcycle equipped for touring, the latter hidden from curious eyes inside the garage space, re-sealable on both sides. On the side of the motorcycle opposite the sleeping area there is a small vestibule, useful for example for cooking. 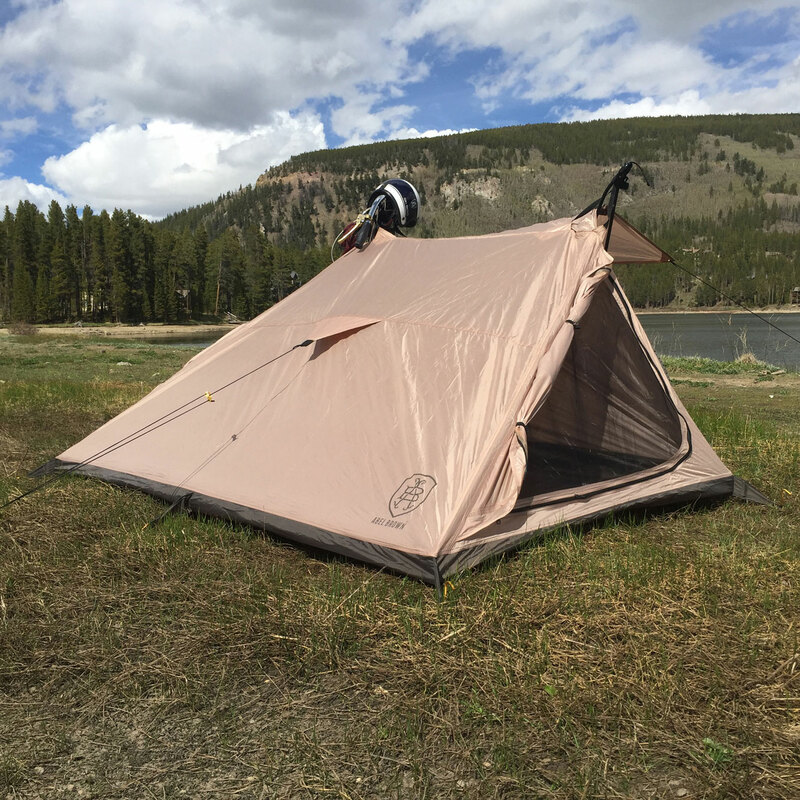 The tent is easy to set up and with practice you can mount it, according to Lone Rider, in 7 minutes thanks to a system with closed sleeves on one side. The polyester floor is of excellent quality and fits the inner sheet of the sleeping area and the garage area. 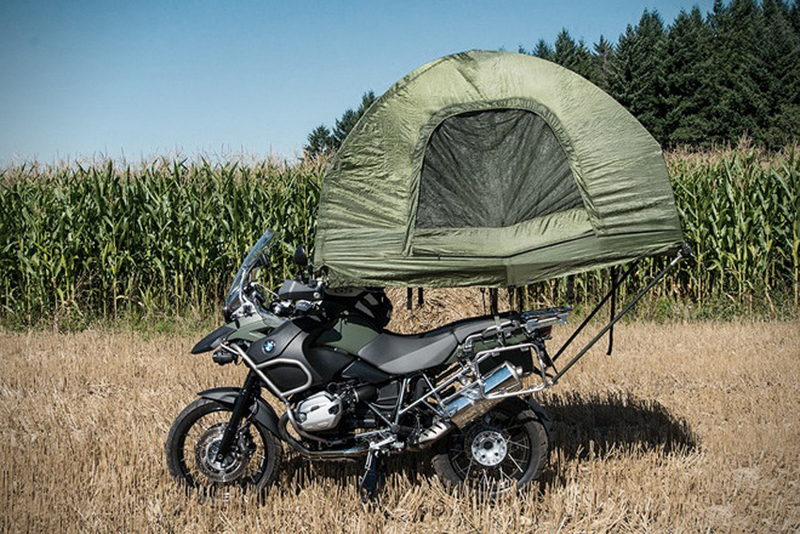 The manufacturer indicates the MOTOTENT V2 as the lightest tunnel tent capable of seating a motorcycle on the market: only 5.9 kg. Waterproof zippers and the Fly hydrostatic fabric also maintain the inside dry during a downpour (resistant to 10,000 mm of water). The same fabrics are flame retardant and resistant to UV rays. Comfort is guaranteed by the possibility of standing in the middle of the tent (190 cm). 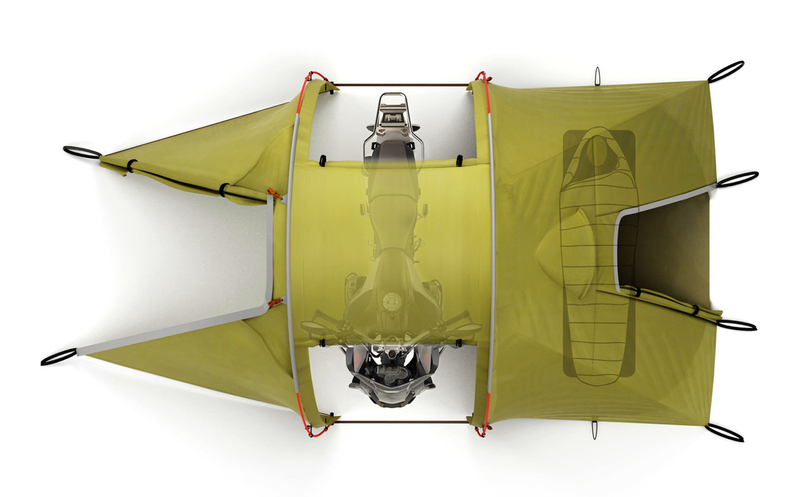 Interesting is the possibility to disconnect the internal sleeping area to transform the entire tent in a space where you can work on the bike in case you need mechanical interventions. SPECIFICATIONS: Weight: (poles, tent, tie rods, etc. ): 5.9 kg; packed size: 60 x 20 cm; inner fabric: 190T breathable CPAI84 Nylon; pegs and stakes in aircraft aluminium 7001-T6. 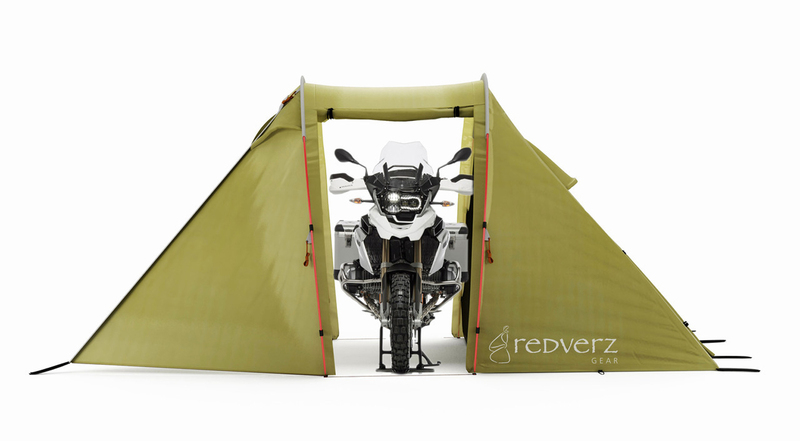 With a lower price to the previous two Redverz options without losing sufficient space to accommodate you, a partner and the bike, this legendary tent is one of the best solutions we encountered. Developed by the brand testers, the Ténéré features a specific design for motorcycle trips. The structure includes a comfortable sleeping area for a couple and two vestibules of which the largest is used as a garage for the bike: here you can stand without touching the “roof”, work on the bike and change clothes. The whole “package” takes a 25 x 53.3 cm space and weighs only 5.8 kg. SPECIFICATIONS: 3 seasons tent; People: 3; average weight 3.6 kg; maximum width 254 cm; maximum length 449 cm; Floor size: 229 x 127 cm; sleeping area: 226 x 170 cm; space for the bike: 254 x 127 cm; Maximum height: 193 cm; Doors: 4; floor material: Polyester 120 g; rainfly fabric: ripstop nylon 210T; number of poles: 3, in 7005 aluminum. Also the Atomic 3 tent was developed with motorcyclists in mind. The difference compared to the others is represented by the large front space with three entrances, which offers space for 2/3 motorcycles with luggage. The height of the tent, not only at the centre but also at the entrance of the sleeping area, is another plus to evaluate. The fabrics used are breathable (68D polyester) and waterproof up to 3,000 mm of water; the seams are sealed. Not lacking in net areas for ventilation. The Atomic 3 tent is a reliable travel companion “made in Italy”. The company is in Bolzano. On Ebay you can find it at a lower cost. SPECIFICATIONS: People: 3; 68D Polyester outer fabric; breathable fabric; dimensions 235 x 220 x H175 cm; basic structure in the EP; Fiberglass poles; Total weight: 8.3 kg Packaging dimensions: 45 cm x Ø29 cm. A tunnel tent, Easy Camp can accommodate up to 3 people and has a large garage space. Equipped with a triple anchorage system (ideal if you are traveling in windy areas), the Spirit 300 offers a “solid” shelter to the couple and extra luggage space. Indeed it is perhaps too large for a big solitary raid but it’s perfect for weekends and summer vacations by bike. Considering the presence of a tunnel and an external porch, with detachable base, the assembly appears however easy and fast. The entrance gates are two (front and back); in the sleeping area a lantern can be hanged, and comes with a convenient pocket … to keep things tidy. The outer fabric is breathable polyester tested to withstand water up to 2000 mm, not a very high figure. But then, given the very competitive price of the tent, some compromise must be made. The floor is 100% polyethylene. The poles are made of fiberglass. SPECIFICATIONS: pole diameter: 7.9 / 8.5 mm . ; packed tent measures 62 x 21 cm (W x D); weight: 4.4 kg. 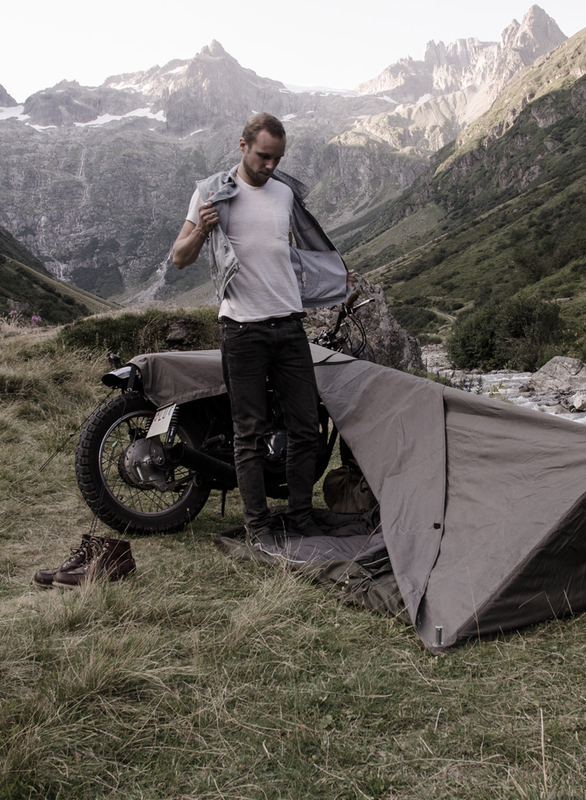 Bivouac is a “minimal” tent, designed and built by hand from the Swiss company Exposed, which uses the bike as a backbone. This solution allows to minimize the bulking of the packing. Does it protect you? Under Bivouac there is enough space for a person + luggage. 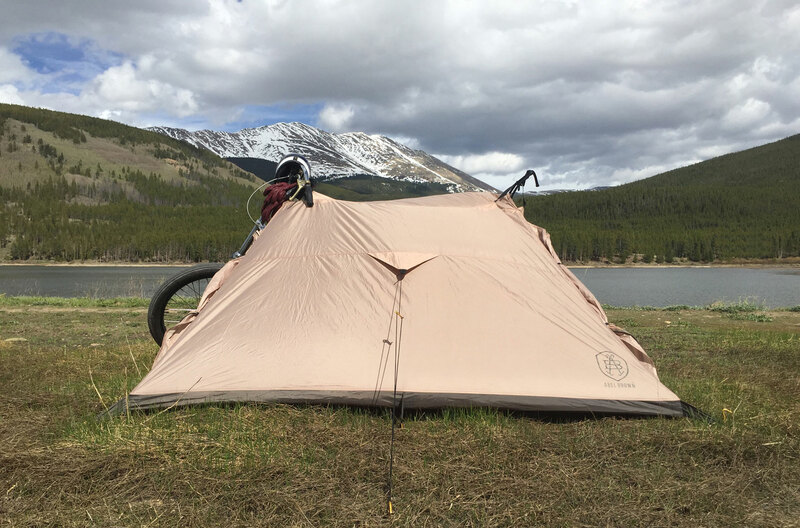 If what you want is a “pure” contact with nature, this tent is for you.What we can assure you about is the care taken by the manufacturer in the choice of materials, selected to last really long. The main fabric is Cordura, treated at fiber level with a coating that ensures maximum water resistance. A large zip opening allows you to stand on the base and quickly access baggage; the project takes into account the different heights of the bikes and provides for adaptation. Installation is fast, and the “sleeping area” is always protected from the rain. 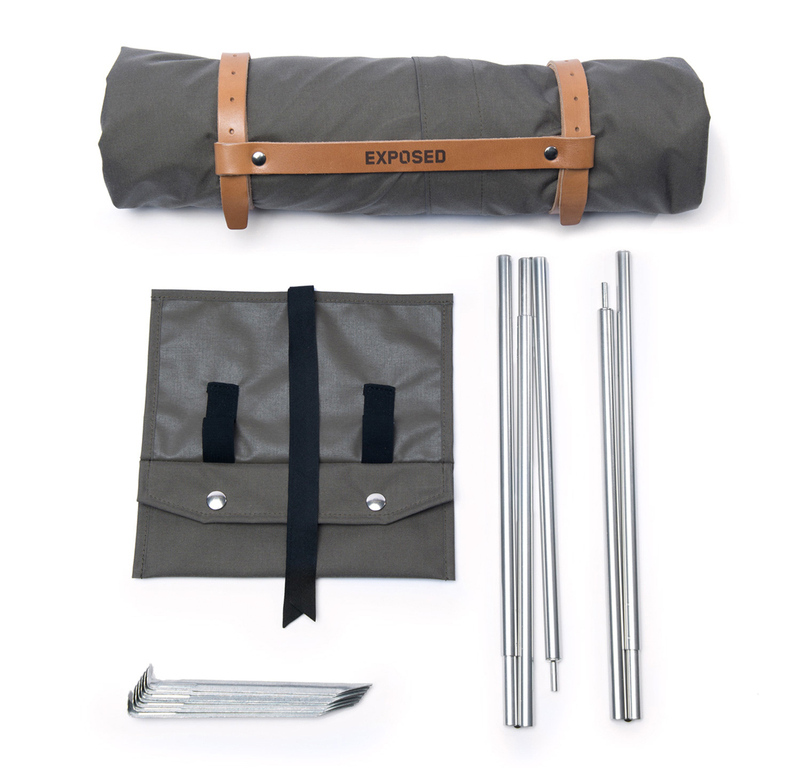 The tarpaulin, a peg and a compact pole are the three elements that make up the Bivouac tent. To keep them together is a leather strap that also serves for mounting. SPECIFICATIONS: Material: waterproof 500 denier Cordura Classic; dimensions: 15 cm roll diameter and 45 cm in length; Weight: 2.3 kg; Warranty: 10 years. We are in the non-stand-alone tents’ section, that is, where the bike has a leading role. From this point of view the Nomad is one of the “frontrunners”. The previous model has welcomed many travellers and it is now the turn of the Nomad 2, which is presented to fans in a renewed version that adds a few extras to the characteristics of the original model. Its single-wall structure is made of waterproof nylon and its base in heavy waterproof durable polyester. On both sides there are net areas which allow the air to flow when the heat increases. The original Nomad and version “2” do not use poles: it is the motorcycle itself to act as a support point. The taller the motorcycle is, the greater will the useful internal space be. Included in the the up-grade are: additional coverage for the bike, the use of a lighter and more waterproof and resistant fabric, slight differences on quotas. To prevent unstable situations, an aluminium plate is provided to be placed under the bike stand. The pegs (8) are made of anodized brass. DETAILS: 50D rip-stop polyester; YKK waterproof zippers; Floor dimensions: 213.3 x 42 “; height: 91.5 cm. 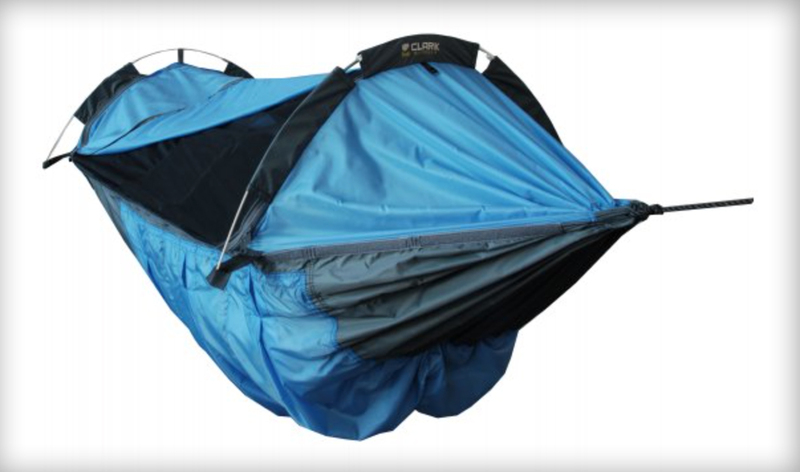 It seems that the Clark brand is the only one to offer a covered hammock where two people are able to sleep comfortably inside. The Vertex model goes further by offering two beds with independent stability and space for luggage. 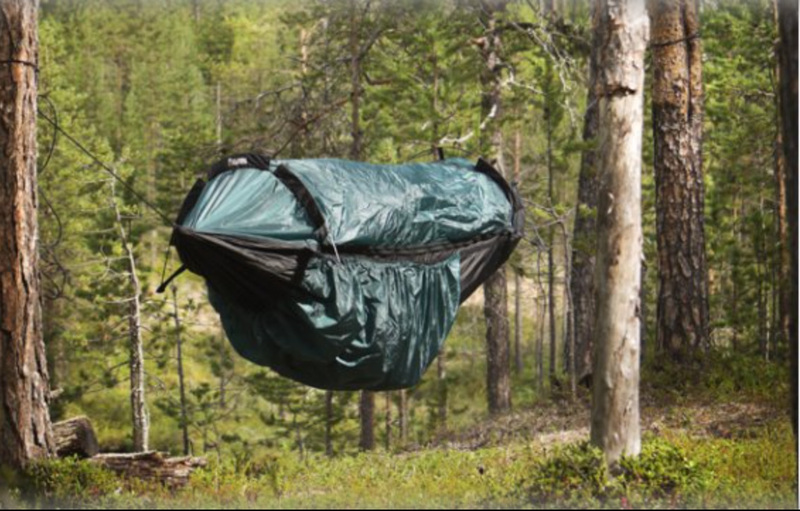 Despite being suspended, this hammock allows one of the two occupants to get out … without letting the other one know.The Vertex has mosquito net fabric and a WeathShield zip, breathable, which keeps you warm when you need it and adds privacy. Very high quality materials, seams, tie rods. SPECIFICATIONS: People: 2; Climate: 3-seasons; packaging weight: 2.3 kg; Packing size: 50 x 17 cm . ; Weight Limit: 113 kg (per room); Total weight limit (people and things): 318 kg. This is the single-seater version proposed by the North American CLARK. The licensed system designed for the NX line has made it one of the best-selling 4 seasons hammock. Ready to face even winter temperatures, it combines the feeling of spaciousness and comfort to an easier than ever set-up. 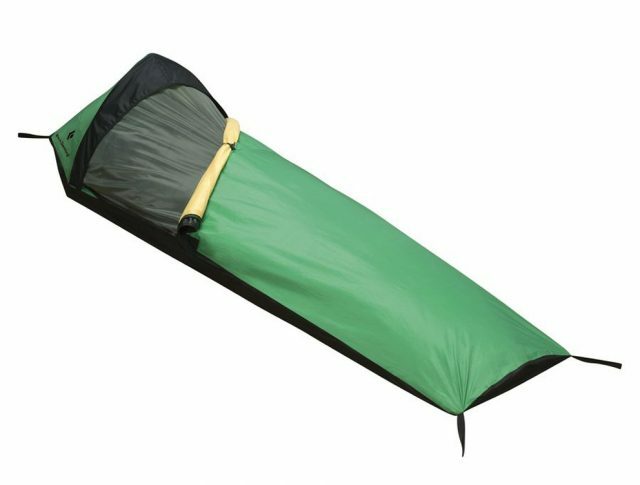 The NX270 has internal pockets and six insulating compartments in the hammock where to put boots, gloves and other accessories to keep dry.In particular, the model has a multi-layer structure A) the net cover, B) the breathable fabric with WeatherShield zip, which transforms the hammock into a real enclosed tent supplying heat and a barrier against wind and rain, C) a further thermal insulating layer that keeps within an appropriate temperature even when outside there are 0 degrees. 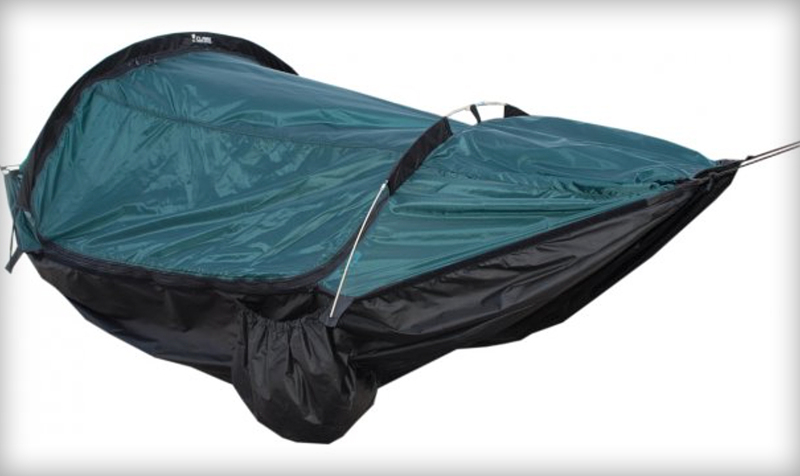 It is a free-standing tent, slightly larger than the sleeping bag. With a single wall design it allows to save up on space and weight, virtually eliminating the classic structure with poles and strings which accompanies conventional tents. 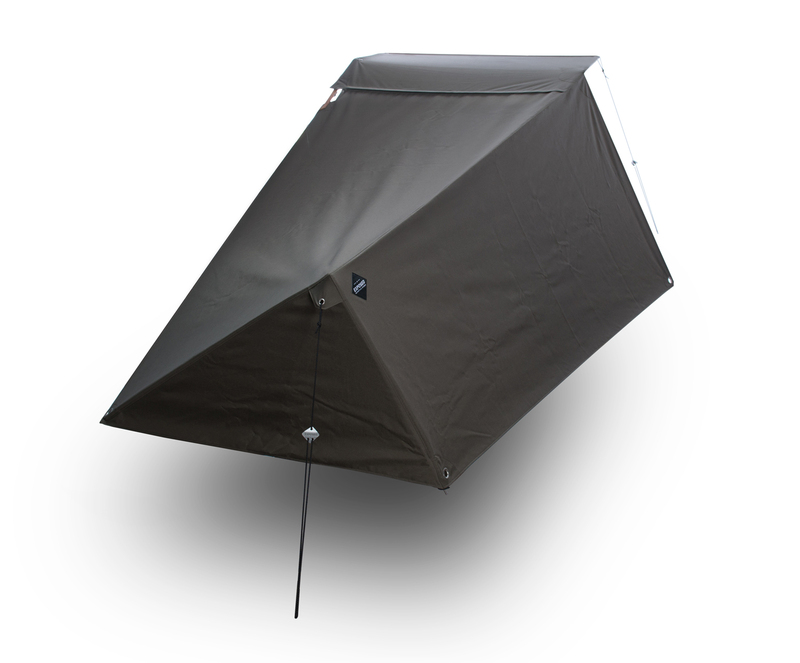 Ideal as emergency accommodation … when you can’t find a roof over your head, BiPod is ready for use and is indicated as “suitable for 4 seasons”. For its realization, the producer has chosen the Todd-Tex waterproof and breathable material, robust and able to minimize condensation. Welded seams and a 7075 T9 aluminium arched pole inside that rising creates space above the head and shoulders to improve the air flow and relieve the sense of claustrophobia ( the Mesh panels also contribute to ventilation and keep insects out. Large entrance with zipper for easy access. Do not miss the anchor to the ground with compact rods. The tent fits into a backpack. SPECIFICATIONS: People: 1; Climate: 4 seasons: Dimensions: 233.6 x 76 cm; internal height 50.8 cm; packed in size from 15.3 x 38 cm; weight: 0.6 kg.